Wilderness adventures abound in the pristine and remote Quesnel Lake Watershed. This is a place of both stunning beauty and fascinating history. For example, visit waterfalls, ancient cedar rainforests, and miles of sandy beaches. On the way, you could encounter mountain goats, bears, moose, deer, river otter, eagles and many types of water birds. Relive the 1860’s Cariboo Gold Rush. Start with a visit to the community of Horsefly, 42 km from us. There you will find amenities lake a grocery store, gas station, art gallery, museum, pub and cafe. During the gold rush this was the site of Harper’s Camp. In the fall, it’s also a great place to witness spawning Sockeye Salmon! Nearby, explore Quesnel Forks, a gold rush ghost town on the Quesnel River, that quietly stands today much as it did back in the mid 1800s. Some of the best trout fishing anywhere! Motor boat or paddle our rivers & lakes. Stroll miles of secluded, sandy beaches. Be sure to take your camera along! Journey endless mountains and valleys. Travel the historic Cariboo Gold Rush Trail. 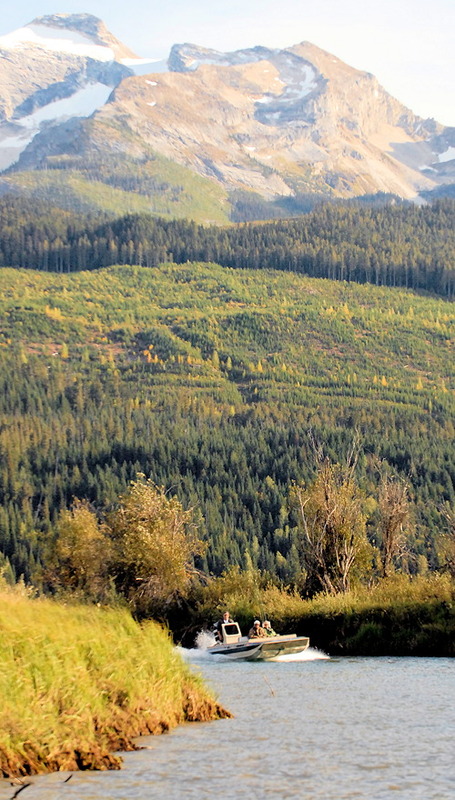 Nestled in the Cariboo Mountains, Elysia Resort is an ideal base camp for wilderness adventures. Paddle one of the many secluded lakes or streams. Boat beautiful Quesnel Lake and wander the many miles of secluded sandy beaches or picnic at a roaring waterfall. Go wildlife viewing and bird watching. In the fall, you can witness thousands of spawning salmon. Your wilderness adventure awaits at Elysia Resort! Fish your choice of world class rivers and streams for wild rainbows and bull trout! Take to the big lake and fish the bays and creek mouths in pursuit of a unique strain of monster rainbow trout or some hefty lake trout. Or, cast a fly to aggressive, wild BC rainbow trout in a secluded wilderness lake. Spend a day with one of our experienced guides, or set out on your own. There’s a fishing adventure for everyone. No matter what type of wilderness adventure you prefer, hiking, walking, canoeing, boating, or beach combing, you’ll find the wildlife viewing opportunities exceptional in the Quesnel Lake area. This is home to mountain goats, mountain caribou, cougar, grizzly bear, black bear, moose, deer, wolf, trout, spawning salmon and bald eagles, loons, osprey, kingfishers and more. Have your camera ready! The Quesnel Lake Watershed has one of BC’s largest Sockeye salmon runs. In the autumn, the salmon return to spawn in our streams and lakes. A female lays between 2,500 and 8,000 eggs. Yet, only about one out of every two to four thousand eggs hatches, reaches maturity and returns to its spawning grounds from the ocean, a 750+ km journey from the mouth of the Fraser River. Come witness their amazing return!